Venturer is poised to unveil what it promises is its best HD DVD offering yet, featuring a "striking, unrivalled picture in staggering HD quality" at "an incredible price". 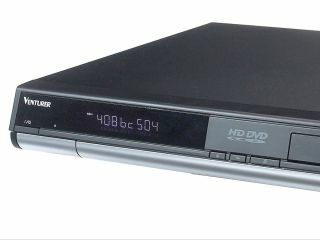 The new Venturer SHD7001 is the Euro version of the $199 HD DVD player that went on sale in the US. It's a tempting high-def upgrade, especially if it sells with a sub-£200 price point. Strangely though, the only place you'll be able to buy this plain-Jane player is on digital shopping channel QVC. The Venturer SHD7001 offers 1080i video output via an HDMI connection, not full 1080p. The lack of 'full HD' puts it on a par with Toshiba's HD-E1 model, which can now be picked up online for £180 or less. The exact price of the Venturer SHD7001 is under wraps until the 29 December launch date. But considering the plummeting price of the HD-E1, Venturer's machine not only needs to hit an ideal £199 price point, but better it. As mentioned, Venturer's HD DVD player will be available exclusively from the QVC TV Home Shopping Channel. It will come bundled with HD DVD copies of Hulk and Troy, as well as an HDMI cable. Available in black and silver, the Venturer SHD7001 is fully backward-compatible with - and can upscale - standard DVDs.